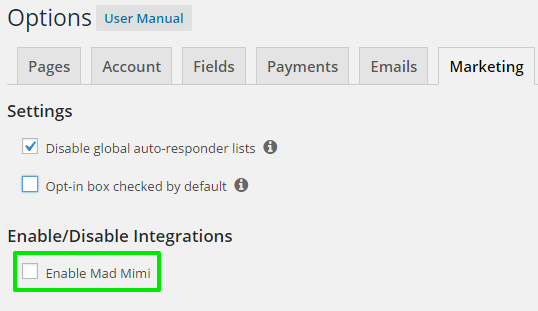 In your dashboard, head to MemberPress -> Activate -> Addons and click to install the Mad Mimi addon. Once it's installed, activate it and you'll see the Mad Mimi integration available in the "Marketing" tab of the MemberPress Options page. Enter your username in the Mad Mimi Username field. 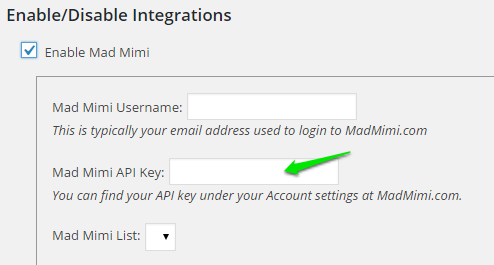 Login to MadMimi.com and go to Account to find your API Key as seen below. 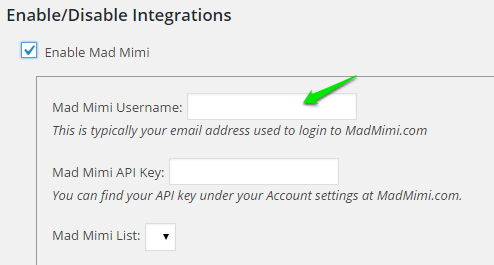 Copy your API Key from the Account settings, then paste it into the Mad Mimi API Key field in MemberPress. Once MemberPress has established a connection, select your Mad Mimi List from the drop-down option. Once you have completed the steps above, by default, MemberPress will automatically add the email address for everyone who signs up through your membership registration form to your Global email list in Mad Mimi. MemberPress never removes a user from the Global list. Once you have Mad Mimi enabled, a new option becomes available under the "Advanced" tab of the Membership edit pages. This option allows you to select a list that only members who purchase that Membership should be added to. Members will be automatically added to or removed from this list depending on their current Subscription status for this Membership. This list must be different from the Global list you have specified in the Options, and should be different from other Per-Membership lists as well.